An award-winning Camellia, and new to our range for 2018! Be one of the first to show off this fabulous Camelia in your garden. Pink-red flower buds open to reveal white-pink flowers. Abundant blooms and coloured stems. A perfect patio performer. Suppled as an established plant in a 13cm pot, ready for planting out. New to our range of shrubs for 2018, be one of the first to have this fabulous Camelia in your garden next spring! Be the envy of your gardening neighbours and welcome in the gardening year with this unusual Camelia, with pink buds forming along the slender branches and then opening to reveal perfectly formed, small white flowers, flushed with pink on the outer edges. To add to the stunning show, new shoots are red when they first emerge, creating a fiery burst of spring colour. Camellia rosthorniana Cupido® is a compact, evergreen shrub with an upright pyramidal growth, making it an excellent specimen for a container on your patio or in your flower border, providing structure and colour throughout the year. This means that you can enjoy the colour spectacle not only from your garden, but also from a patio or balcony. A definite sight to behold, 'Cupido' provides year-round garden interest, with its pastel flowers, flaming shoots and glossy leaves. 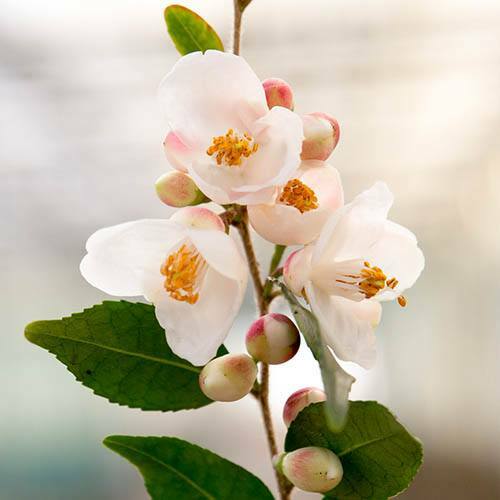 Camellia rosthorniana Cupido® is an award-winning plant - winner of a Bronze Medal Plantarium 2012 - and performs best in partial shade in moist, well-drained soil. Performs best in partial shade in moist, well-drained soil, protected from early morning sun. Protect from cold, dry winds and early morning sun to prevent damage to the emerging buds and flowers. Container-grown plants will need protection in winter. Water established plants in dry weather to prevent bud drop and apply a balanced liquid fertiliser in mid-spring and in June. After flowering lightly trim any branches that spoil the appearance of the plant, including any that are damaged or dying.